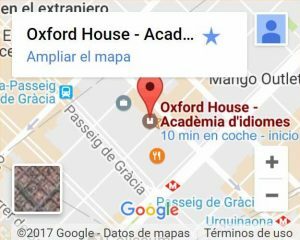 This website is owned by OXFORD HOUSE (OXFORD TEFL, SL), CIF B6174055, address in Barcelona, C/Diputació 279 Bajos, 08007, Barcelona and registered in the Companies Register of Barcelona with the following information: Volume 30959, Sheet 0037, Page B182188, Registration No. 2, hereinafter OXFORD HOUSE. For any questions or suggestions, please contact us by e-mail at info@oxfordhousebcn.com. This website is governed by legislation exclusively applicable in Spain, and both Spanish nationals and foreigners who use this website are subject to it. At any time, we can modify the presentation and configuration of our website, expand or reduce services, even remove it from the network, as well as the services and content provided, all unilaterally and without notice. All contents, text, images, and source code are owned by OXFORD HOUSE or third parties who have acquired rights to use them, and are protected by Intellectual and Industrial Property rights. The user is only entitled to a private use thereof, not for profit, and needs the express authorization of OXFORD HOUSE and/or the holder of the rights in order to modify, reproduce, exploit or distribute them or any right belonging to the owner. The establishment of links to our site does not grant any right. In the same way, the simple fact of establishing a link to our website confers no right to be granted the status of collaborator or partner of OXFORD HOUSE. It is absolutely forbidden to copy either all or part of our website. Access to our website is free and requires no subscription or registration. However, the use of some of our services may require filling out forms. These services will be properly identified on the website, with easy instructions to register. The user must access our Website in good faith, in accordance with rules of public order, and these General Conditions of use. Access to our Website is at the user’s own and exclusively liability, and the user shall be liable for any damages he/she causes to third parties or to us. Taking into account the impossibility of control with regard to information, contents and services contained by other websites to which access may be obtained through the links that our website makes available to you, we inform you that OXFORD HOUSE is released from any liability for damages of any kind that may derive from the use of these websites unrelated to our company by the user. OXFORD HOUSE reserves the unilateral right to terminate any user, without notice, who the organization understands has violated the conditions governing the use of our website, the user has no right to any claim following this type of action. OXFORD HOUSE reserves the right to exercise the pertinent legal actions against USERS who breach these general conditions of use, and the USER accepts that the failure to initiate such actions does not constitute a formal waiver thereof, but that such actions shall remain in force until the breaches have become statute-barred. Confidentiality and security are core values for OXFORD HOUSE and consequently we are committed to guaranteeing the privacy of the User at all times, and not collecting unnecessary User information. For what purposes we collect the data which we request. What the lawful basis for processing it is. To which recipients your data is communicated. See information in the preamble. Purpose: To provide a means by which you can get in contact with us, and to answer your requests for information, as well as to communicate to you about our products, services and activities, including by electronic means (email, SMS, WhatsApp), if you tick the accept box. Lawful basis: The consent of the user upon requesting information from us via our contact form and ticking the button for accepting the sending of information. Storage: When the request via our contact form has been responded to or answered by email, unless a new processing of the data has been generated, and in the event of having agreed to being sent commercial communications, we will store the data until we receive a request to unsubscribe from the aforementioned communications. Purpose: To reply to your requests for information, respond to other requests, and answer your questions. In the event of receiving your CV, your personal and educational information can be added to our databases in order for you to participate in our present and future selection processes. Lawful basis: The user’s consent upon requesting information via an email address or sending us their information and CV in order to participate in our selection processes. Storage: Until your request via email has been responded to, unless a new processing of data has been generated. *** In the case of receiving a CV, your data can be stored for a maximum of one year in order to participate in future selection processes. In order to provide your personal data you are required to be at least 14 years old, or when applicable, have sufficient legal capacity to enter into a contract. In general, it is absolutely forbidden to provide personal data from children under 14 without the consent of parents or guardians. The personal data we ask for is necessary in order to manage your requests, register you as a user and/or provide the services which you may contract. Therefore, if you do not provide this information, we will not be able to attend you correctly nor provide you with the service which you have requested. Your data is confidential and will not be released to third parties, except when we are legally obliged to do so. 4. YOUR RIGHTS IN RELATION TO YOUR PERSONAL DATA. Any person may withdraw their consent at any time, when that person has given permission for the processing of their data. Under no circumstances shall the withdrawal of consent restrict the execution of the subscription contract or the relationships generated previously. To request access to your personal data or its rectification should it be incorrect. To request its removal when, for example, the data is no longer necessary for the purposes for which it was collected..
To request the restriction of its processing in certain circumstances. To object to processing of your personal data for reasons associated with your personal situation. To request the transfer of your data in the cases provided for in the regulations. Other rights recognised in the applicable legislation. Where and how to exercise your Rights. In writing, addressed to the controller at the postal or email address (to be found in Section A), with the reference •”Personal Data”, specifying the right which is to be exercised and with regard to which personal data. In the event of disagreement with the company in relation to the processing of your data, a complaint may be made to the Data Protection Agency (www.agpd.es). 5. SECURITY OF YOUR PERSONAL DATA. We would like to inform you that, with the aim of safeguarding the security of your personal data, we have adopted all the necessary measures of a technical and organisational nature to guarantee the security of your personal data from the risk of being altered or lost, or from unauthorised access or processing. So that we can keep your personal data up to date, it is important that you notify us whenever there is a change to your information. In the event that we are not notified of any changes, we do not accept responsibility for the veracity of the information in question. We do not accept responsibility for the privacy policies of any third parties to whom you may provide your personal data via links available on our web page. By making this Website available to the user, we wish to offer you a whole series of quality contents and services, using the utmost diligence in the provision thereof and in the technological media use. However, we will not be liable for the presence of viruses or other elements that may in any way damage the user’s computer system. The USER is prohibited from any type of action on our website that causes an excessive overload on the operation of our computer system, and from introducing viruses or installing robots or software that alters the normal operation of our website, or that may cause damage to our computer systems. The USER undertakes all responsibility deriving from the use of our website, and shall be solely liable for any direct or indirect effect on the website that may arise, including but not limited to any adverse economic, technical and/or legal result, as well as failure to meet the expectations generated by our website, and the user undertakes to hold OXFORD HOUSE harmless from any claims deriving directly or indirectly from such events. OXFORD HOUSE is released from liability for any claim in respect of intellectual property rights on the articles and images published on its website, and does not warrant the accuracy, veracity and current validity of the contents of this website, whether its own or of third parties, linkable to other websites, and is fully released from any liability deriving from the use thereof. The USER is fully aware that merely browsing on this website, and using its services, implies acceptance of these conditions of use. The USER acknowledges that he/she has understood all the information relating to the conditions of use of our website, and acknowledges that they are sufficient for the exclusion of any error therein, and therefore expressly accepts them in full. All matters relating to our website are governed exclusively by Spanish law. In the event of any type of discrepancy or difference between the parties in relation to the interpretation and content of this website, all the parties submit to the Judges and Courts of Barcelona, expressly waiving any other venue.